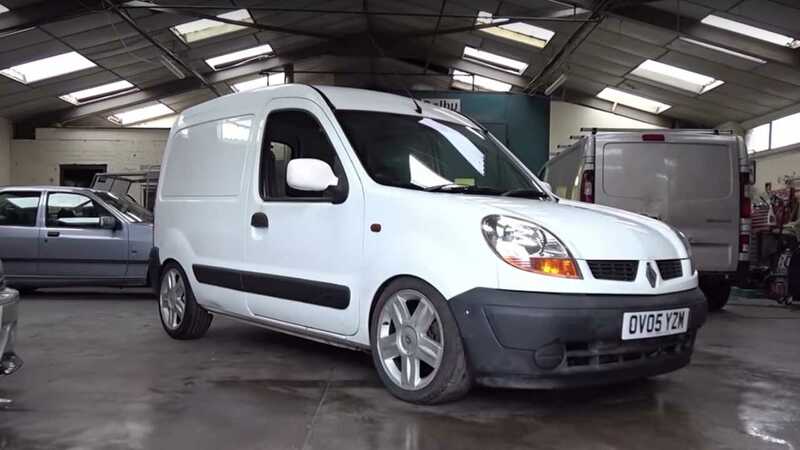 When you see a white Renault Kangoo casually strolling through the streets of London, you would probably think that it's on its way making a neighbourhood delivery. The French passenger/cargo van isn't something that you'd think would go flat out– well, not if it has a Megane RS engine under its bonnet. Youtube's Monky London was able to spot this sleeper, which, according to the owner, was a van from his sister. It's a panel van, as you can see, and its humble utilitarian design is hardly representative of the speeds and acceleration it is capable of putting down. The Kangoo I is a passenger and cargo van that was introduced in 1997 and ended production in 2007 to make way for the Kangoo II. This particular unit is a panel van where the rear seats have been removed to be specifically used to transport cargo. It was originally powered by a diesel engine, which is why you wouldn't expect it to tear down open streets. The Clio, on the other hand, is a subcompact hatchback that has been consistently one of Europe's top-selling cars since its launch. Being a small car, it's an economical choice but it has an RS trims that could surprise you. Lastly, the Megane RS is a hot hatch that could easily go head to head with the Honda Civic Type R and Hyundai i30 N. This turbocharged 225 engine is from the first-generation of the Megane RS, capable of producing 222 bhp in its stock form.